All New! All Improved! All Original! 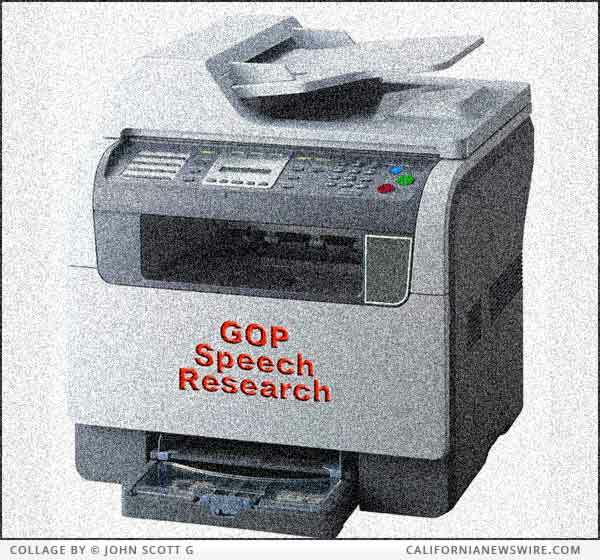 That’s how GOP officials are describing the content of Conservative statements and speeches. After the brouhaha over Melania Trump’s plagiarizing of Michelle Obama’s address to the 2008 Democratic convention, there has been more active scrutiny of all comments from Conservatives. On the campaign trail at least three days each week, The Donald is often found addressing a crowd in an airplane hangar, where his calls for unconstitutional and racist acts are duly noted by the media and then ignored by a majority of Americans. Rapidly becoming known as a modern day sage and a truly deep, deep thinker of thoughts and other deep ideas, the Junior Don has been defending his stepmother as much as possible. The former governor of Indiana is currently Donald Trump’s hostage — er, running mate. As such he is going around the country speaking to throngs of Republicans and whoever can be paid to show up. He is fond of quoting from a Martin Luther King speech (“I have a dream”) and he is quite faithful right up to the end of the paragraph. Chairman of the Fox Fake News Channel, where he is known and revered as Mr. Jabba-the-Hutt, Ailes has been rumored to be on his way out from his highly overpaid position because of charges of sexual harassment. “Is that because Conservatism wants to turn back the clock?” I asked. “To about 1850,” he said. “Before copying machines,” I said.